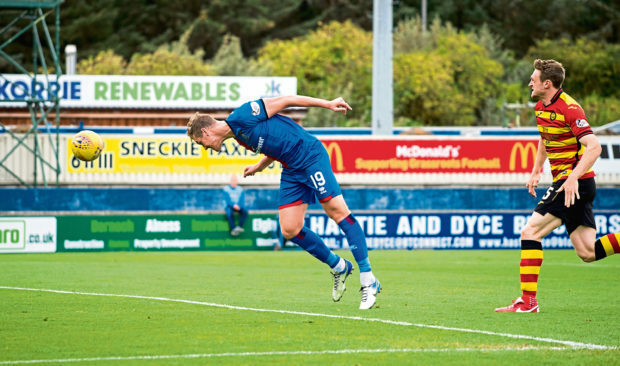 Caley Thistle forward Jordan White feels the Highlanders can make a send out a statement by upsetting Championship leaders Ayr United at Somerset Park tomorrow. Inverness returned to winning ways in emphatic fashion by defeating Edinburgh City 6-1 in Tuesday’s Scottish Cup third round replay, having seen their 25-match run without a league defeat ended by Falkirk’s 3-2 victory at Caledonian Stadium on Saturday. Caley Jags face a quick turnaround for tomorrow’s trip to face the Honest Men, who are two points clear at the top of the table in their first season since winning promotion from League 1. White, who netted a hat-trick against Edinburgh in midweek, feels his side need a big result and the Bellshill-born attacker insists Tuesday’s victory has put John Robertson’s men back on the right track. White said: “It is coming into a very important period in the season. We need to stay in with the pack and remain on our toes. “Friday, away to Ayr United, is the perfect time to do that, and gain points on teams above us in the league. “Obviously, we want to turn more draws into wins but it’s a case of making a statement. “A lot of people are discounting us. We’re probably going under the radar but we just need to kick on. White’s hat-trick against League 2 City was a timely contribution after the former Livingston and Falkirk striker was recalled to the side following Saturday’s loss to the Bairns. The 26-year-old hopes Robertson will retain his faith in him for tomorrow’s match, with George Oakley and Nathan Austin also pushing for an attacking role. White added: “We’ve got three good strikers at the club and we’re always going to be rotated. George did well on Saturday, while Nathan has been out with a wee bit of an injury. “He’ll be awaiting his chance and, hopefully, he can do the same. White hailed the impact of teenage attacker Roddy MacGregor, who impressed on his home debut after coming off the bench midway through the second half on Tuesday. White added: “He hasn’t trained with us right from the start of the season, but he’s come in and joined us latterly. He’s got a lot of talent – and I think he showed it against Edinburgh City.